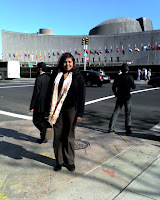 The Jane Addams Book Awards ceremony took place yesterday in Manhattan with the flags of the United Nations as our backdrop (that's me, just before entering 777 UN Plaza for the event). I was terrified I was going to lose it during my talk. Who wouldn't get verklempt when given an award for "children's books that promote the cause of peace, social justice, world community, and the equality of the sexes and all races?" Thank you to the Peace Association for your hospitality at this wonderful event and this great honor for our book Rickshaw Girl. My great-grandmother, who lived in Bangladesh all of her life, was nine years old when she was married. My only memory of her is an old woman sitting quietly in a widow’s white sari. Did she have power? Some might say not much. But she taught her daughter how to draw alpanas, the traditional folk art of Bengal. And she told stories. Wonderful stories. Which meant that her daughter taught my mother to draw alpanas, and told her stories. Thanks to our family’s move here to New York when I was seven, the alpana art skill didn’t pass to the next generation. The love of stories, however, did. I wrote Rickshaw Girl for my great-grandmother, and for girls today in Bangladesh who still don’t have many choices. The good news is that when I lived there for three years, I traveled to the villages and was thrilled to see that life is changing slowly but surely for young women. Like Jane Addams, Muhummad Yunus of the Grameen Bank is a Nobel Peace Prize winner and a genius with a big heart. Thanks to women’s banks that offer loans at lower interest rates, these girls have opportunities that my great-grandmother never had. They can start and manage small successful businesses, like the rickshaw painter in my novel. I want to thank my father, whose love for his three daughters rivals the fictional paternal love in my book. My mother, for beautifying our American home with alpana art, Tagore songs, and the great smells of her savory cooking. My sisters, husband, and sons for constant support and cheerleading. Jamie Hogan, who bridged cultures so beautifully with her illustrations, and Judy O’Malley of Charlesbridge, who edited the book with unmatched care and compassion. Naima’s story wouldn’t be here at all if Judy hadn’t taken it under her wing. Last but not least, I want to thank God, the Author of my story. Don’t you think Jane Addams, one of my personal heroes and champion of immigrants, would be pleased that a writer born in Calcutta would be receiving this honor today? I think she would. Thank you all so much. Illustrator Jamie Hogan came next, and she got choked up talking about how she resonated with the father's love for his daughter in the story. It probably didn't help that Jamie's own hubby and daughter were sitting side by side in the audience. That did it. We were unanimously verklempt, but sweetly so. 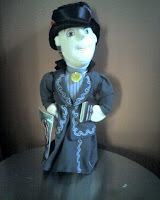 very own Jane Addams dolls! Yippee!